Pre-construction. To be built. Are you looking for some room to roam and not have a neighbor right on top of you? Tucked away exclusive area of 8 beautiful 1 acre plus home sites with NO CDD or HOA fees. Nestled within the north-western community of Lutz in Hillsborough County only minutes from downtown Tampa and University of South Florida. 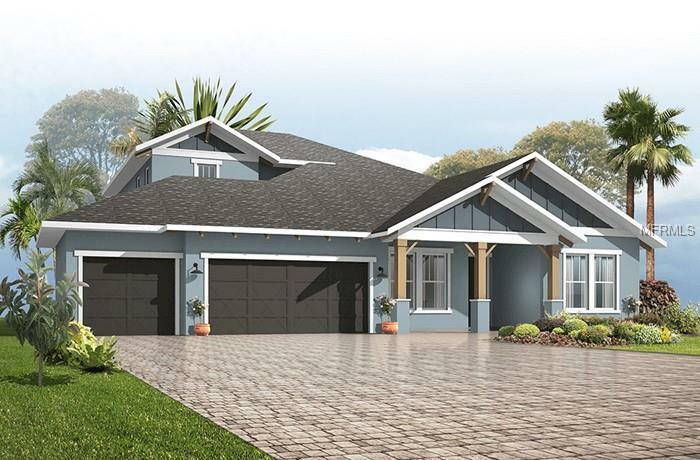 This Barrett Craftsman model home boasts 4 or 5 bedrooms plus a den/office plus a second floor bonus room with a must-have 3 car garage and 3 full baths. You’ll love the great room plan and gourmet kitchen, but you’ll especially love the privacy and space between homes. Semi custom builder offers far more quality standard features than most other builders such as: 3 cm granite counters, Tankless hot water (gas communities only), 5.25? Victorian baseboard, 3.5? Victorian casings, Epoxy garage floor coating, RedGard coating applied under all tile, Bora-Care termite treatment on interior walls, double-glazed low-e windows, 30-year dimensional shingles, pest control tubes in walls, Water softener loop pre-plumbed , vapor barrier steel reinforced concrete foundation, Structurally engineered roof trusses secured with high-strength galvanized steel hurricane straps, Masonry block wall construction with engineered poured concrete cells with steel reinforcement. NOTE: List price is base price only and does not include lot premium, elevation upgrade, structural and design center options. Contact new home consultant directly as pricing and incentives are subject to change.